Connecting Country’s area of interest is defined as the Mount Alexander region of Central Victoria, which encompasses the Mount Alexander Shire (an area of 152,895ha) and extends a short distance into the neighbouring shires. 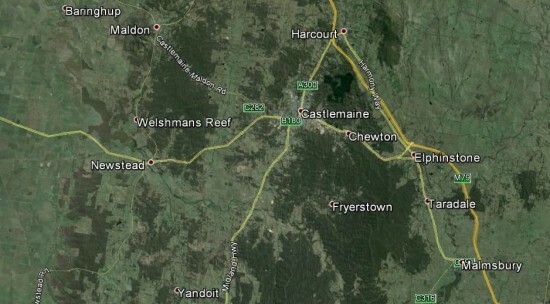 It includes the towns of Castlemaine, Newstead, Maldon, Harcourt and Taradale, and many others as well. The region contains a diverse range of environmental values, which have been used by humans for thousands of years. The Mount Alexander Region and beyond is “country” for the Dja Dja Wurrung, who are the traditional indigenous people. In using this term and concept as the name for our organisation, we hope to acknowledge and encourage the concept of stewardship for the land by all its inhabitants. 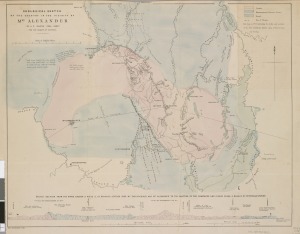 The Mount Alexander region overlaps with four separate bioregions – the Goldfields, Central Victorian Uplands, Victorian Volcanic Plain and Victorian Riverina – each of which has characteristic biological and geological values. The landscape is intersected by a number of waterways of historical and ecological interest (including the Loddon River in the west, and the Campaspe and Coliban Rivers in the east). There are a few prominent and well vegetated hills (including Mount Alexander and Mount Tarrengower) and some important agricultural areas. Compared to other parts of south-eastern Australia, this region has relatively high native vegetation cover. Most of this remnant vegetation can be broadly described as ‘box-ironbark forest’. There are numerous flora and fauna species for which these forests are one of their few remaining strongholds, including many species threatened with extinction at the state and national level. Some of the notable taxa include the elusive and charismatic Brush- tailed Phascogale; the plant known as Southern Shepherd’s Purse (Ballantinia antipoda) whose worldwide distribution is confined tothe Mount Alexander Regional Park; and the declining Victorian Temperate Woodland Bird Community which has become a focus for Connecting Country. Our focus species, the ‘feathered five’, are ground-foraging woodland birds known to occur in the local area; Diamond Firetail, Jacky Winter, Hooded Robin, Brown Treecreeper and Painted Button-quail. The condition of the box-ironbark forest is generally low-to-moderate due to the legacy of mining, wood collection, excessive grazing by native and introduced animals and weed invasion. Yellow Box Woodlands and other vegetation types in the more fertile parts of the region have been disproportionately removed – and are therefore considered to be threatened ecosystems at the local, state and national scales. The relatively small remnants of these vegetation types tend to be located on private land. Negative effects of these past activities upon local biodiversity are on-going, and there are new threats such as climate change. The larger remnant habitats within Connecting Country’s area form important biodiversity hotspots within a matrix of restoration efforts across Victoria. They act as biological stepping stones, helping to maintain biological connectivity between the Great Dividing Range to the south, the Murray Riverina Plains to the north, and to mosaics of box ironbark forests and open grassy woodlands to the east and west. However, despite being relatively extensive, the habitats within the Mount Alexander region are still significantly fragmented, and there is much opportunity for their expansion and to create better linkages between them. European colonisation in the Mount Alexander region commenced in the late 1830s and early 1840s, and was greatly accelerated from the early-1850s with the discovery of large gold deposits. Since then, agriculture has been the main activity undertaken on private land in the Mount Alexander region. Connecting Country has found that our local farmers wish to manage their land sustainably. They also value the remnant environmental values within and surrounding their properties for their economic, social, aesthetic and intrinsic values, and for the role they play in assisting farm productivity. In many cases, Connecting Country has been able to support these farmers in their management of these biodiverse areas. There are substantial parts of the Mount Alexander region where large farm landholdings are rapidly transitioning into many smaller landholdings. These smaller landholders typically have off-site income, and are not dependent upon making a living from the property through agriculture. Many are ‘tree-changers’ who have purchased the land for the purpose of ‘living in the bush’, and have no intention of stocking it with sheep or other grazing animals. Other landholdings are now farmlets or hobby farms, grazed relatively lightly by low densities of stock such as sheep, horses, goats and alpacas. As a result of this reduced farming intensity, the local ecosystem is changing. Extensive areas of native vegetation are regenerating and native animals and plants are returning. This land use change provides an opportunity for Connecting Country and other groups to facilitate lasting biodiversity gains and protection on these properties. The Mount Alexander region is characterised by an engaged and active community – a high proportion of whom are ‘interested’ in landscape restoration. At the high end of the ‘interest’ spectrum, there are many people already involved and passionate – and have a good understanding of the ecological values and threats within the local area. More often than not, these people are involved with one or more of the 30 local Landcare and Friends groups. At the other end of the ‘interest’ spectrum, there are many people who enjoy and appreciate the local landscape, but who have little experience, involvement or understanding of it. Connecting Country’s challenge is to increase the number of people interested in the local landscape and its restoration, and to move those already with an interest to become more enthusiastic and involved.